What: There's not many figures I own that fit with the name of this blog better than these guys. They are truly little weirdos! 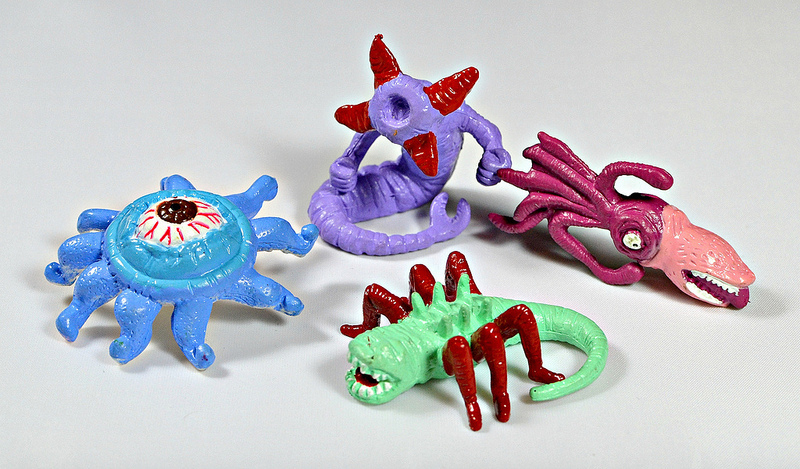 I've had the painted versions of these mutant monster figures for probably around 10 years, and forgot exactly where I got them. But it wasn't until a few months ago that I found out they exist in unpainted translucent/transparent versions! Being a lover of both mono figures and clear figures, of course I had to get some. Both the mono versions and the painted versions are made out of a firm yet flexible plastic and are really awesome. There are eight total sculpts and all of them are a bit twisted and creepy, which is always a plus around here. 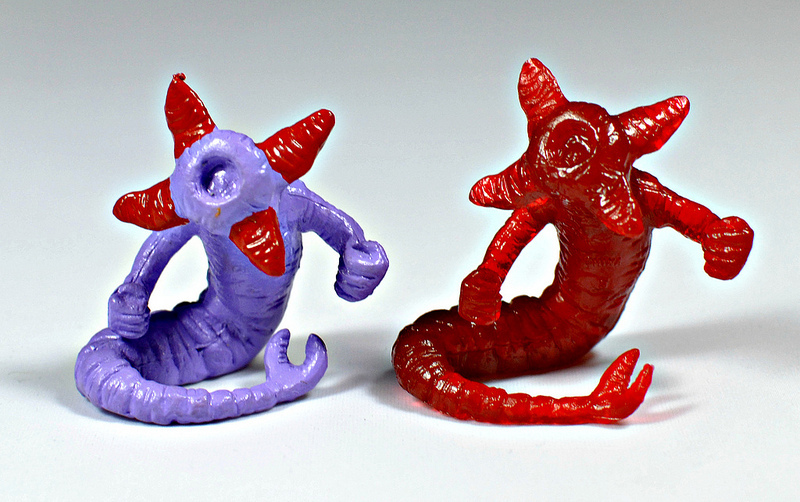 As far as I know they don't have any specific name--they're just sold generically as party favor creatures. Where: I can't remember exactly where I got the painted versions from years ago. It could have been out of a vending machine. Or maybe they were being sold as party favors at a Party City or someplace like that. But I do know that the mono ones are sold at U.S. Toy, both in their stores and on their website. At the time of writing this, they are available to order here. When: 2000s-2010s (the mono versions are still available). Who: I'm not sure who originated these with the painted versions, but the U.S. Toy website currently says they are a U.S. Toy exclusive. Love these - I got my set through someone who bought a bulk lot on the LRG forums. Never seen the painted ones before!